Again – yoga means union! The word Yoga means union, and comes from "yuj" which means "to join," to bring together into union the various aspects of yourself that were never divided in the first place. From that comes the direct experience of yourself (Self) that is beyond the false identities stemming from the seemingly countless colorings of attraction and aversion. Another, more contemporary adaptation of this principle is the word holistic, meaning to become whole, or to realize your underlying wholeness. Patanjali describes this in the Yoga Sutras (1.2) where he defines Yoga as the mastery or control (nirodha) of the modifications of the chitta (“stuff” of the mind or mind field), allowing the true Self to then come shining through (1.3). Patanjali also explains that the purpose of Yoga is discrimination (viveka) among the inner processes (Sutras 2.26-2.29). Similar processes of mastering and/or integrating the mind may be a part of some religions, but that does not mean that regulating your mind in this way is, in itself, a religion. 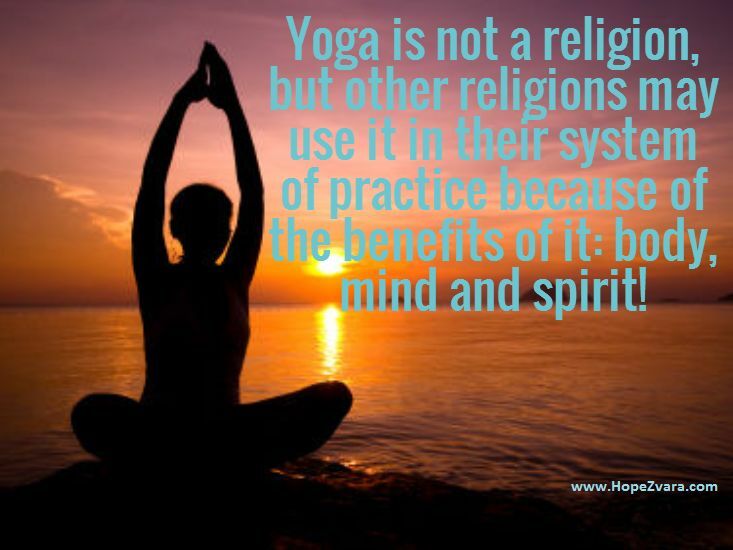 Yoga and religion both share many common virtues. As with many religions, yoga also recommends meditation on, and cultivation of lovingness, compassion, goodwill and acceptance, as well as non-violence, truthfulness, training the senses, non-possessiveness, and other such virtues (see Patanjali’s Yoga Sutras 1.33, 2.30-2.32). So although, religions and yoga both recommend cultivating such virtues, it is self evident that cultivating these ways of being or living are not themselves religion. When these are practiced in yoga, the subtler, finer, truer aspects of our being are revealed, and this may or may not be seen in the context of religion. By definition, is yoga a religion? 1. According to Encarta World English Dictionary, religion posits that people's beliefs and opinions concern the existence, nature, and worship of a deity or deities, and divine involvement in the universe and in human life. Yoga does not require the worship of any specific "deity or deities." The word divine is defined (in dictionaries) as coming from, or connected with God or gods. Yoga does not give specific instructions for the "existence, nature, [or] worship". Yet, yoga acknowledges that bhakti Yoga, the path of devotion is a valid aspect of yoga. Yoga does not tell you where to direct that devotion, or the specific methods by which you should do it. This “direction” of devotion is left to personal religious preferences. 2. Religion adheres to a particular institutionalized or personal system of beliefs and practices relating to the divine. The word divine is defined as relating to God or gods, and yoga itself does not set forth any designation to what or whom one should direct their worship, nor does yoga require it. Although yoga definitely acknowledges the value of bhakti yoga, it does not dictate which form that should take for an individual person. Also, yoga itself is not institutionalized as a religious system, although some of the principles are contained within many religions or other religious systems (examples: kindness to other people, taking care of one's body, regulating breathing, or quieting the mind). 3. Religions establish a set of strongly-held beliefs, values, and attitudes that somebody lives by. Some may argue that yoga is a religion by the very definition of religion as being a set of strongly-held beliefs, values, and attitudes that one lives by. This is not necessarily true since this could also apply to many other things as well, including governmental, educational, psychological, social, cultural, or familial ways of living. Fortunately, most people have a working, day-to-day, common language sense of the meaning of a religion, and it simply does not apply to yoga. Coming next, part 3 of "Yoga – Is It a Religion?"